A LiDAR image of the city of Mahendraparvata on Phnom Kulen. The news stories have largely focused on the discovery of a “lost city” on Phnom Kulen, but this is part of a larger LiDAR survey over part of the Angkor region. 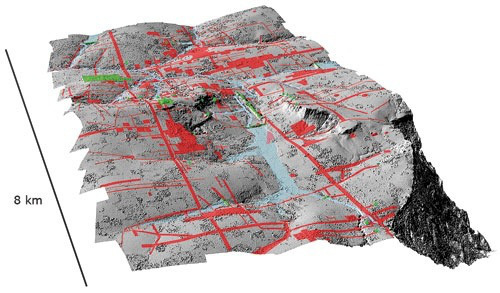 LiDAR is a laser scanning technology that gives you an incredibly detailed view of the landscape, including features you can’t see under dense tree cover or that may not be clear on the ground level. LiDAR has been used before in archaeological studies, but the current project is the largest archaeological use of LiDAR to date. It is also incredibly expensive, and required the formation of a consortium to help fund and support the project. Archaeologists and historians have long known that Phnom Kulen was important to the early history of the Angkorian empire. Firstly because there are some early brick temples, but also because historical texts state that the “founder” of Angkor, Jayavarman II, held his consecration ceremony at Phnom Kulen. I visited Phnom Kulen in 2008 and saw the archaeological work being done by the archaeologist J.B. Chevance and the the Phnom Kulen Program (see more hereand here . Readers who are not archaeologists may also not understand that many archaeologists hold a healthy amount of skepticism regarding historical documents. Texts are often written years removed from when an event took place, contain the bias of the writer, and often have a broader agenda than simply stating what happened when. Historical texts provide a hypothesis to be tested with archaeological data. The goal of archaeology, generally, is notto prove that historic texts were true. If we cannot find archaeological data to support historic texts, then we begin to think more critically about them. Up until now, archaeologists had to consider that the lack of evidence for a Jayavarman II city on Phnom Kulen could indicate that historic texts were incorrect. So yes, there was an idea that Mahendraparvata existed on Phnom Kulen, but archaeologists weren’t exactly sure what the texts were describing the extent of this place. In this way, the information about Mahendraparvata was lost, and the LiDAR data really did lead to the discovery of a lost city.